I have not had a chance to check out the latest edition of the SRAM Red groupset until this week. An average week involves installing Shimano Tiagra or SRAM Apex on most builds (more on these great value-for-money groupsets in a future post). Looking forward to it. A bit ironic, though, that’s it’s taken this long since these units are manufactured just a bit down the road! Since most cyclists don’t have a chance to have a look at the ‘anatomy’ of the technology that is installed ready-to-go on picking up a new bike, I thought I’d point out some of what is behind those snappy (hopefully) yet smooth-as-butter chain shifts thanks to the front derailleur. Every crank has some sort of arrangement of ramps and bosses to facilitate the movement of the chain to the big chainring and back again. 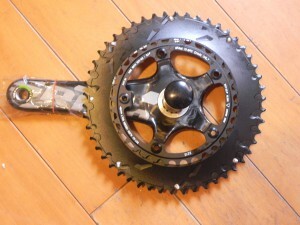 As soon as the front derailleur cage makes contact with the chain, it will encounter the curved face of the crank. The link will catch one of the series of ramps that cut a path in two sections to a boss that projects outwards less than 0.5mm just below the teeth, be hoisted onto this, and then onto the first tooth whereupon it progressively wraps onto the chain ring. Note the symmetrical placement of each ramp/boss combination in groups of three at opposite ends of the curve. Also note the line that runs from the top of the small chainring tooth across the boss, from which the chain departs, to the apex of the tooth on the large chainring. You might also note the beveled apex of the tooth to facilitate the efficient transfer of the chain link in question home onto the tooth. In terms of moving parts, the chain is the most complex component on a bike and it’s always mesmerizing to watch it, almost like a living thing, complete this upshifting process in a blink, or two, of an eye (not something a cyclist really should do all that much of of course particularly at speed!). The smoothness and success of this process depends on a number of other variables as well, mainly how well the front derailleur is adjusted. 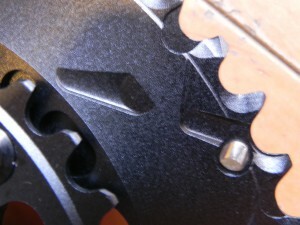 Anything over 0.5mm error on the angle, relative to the chainring, or height above the chainring and inside minimum distance from the chain in the lowest gear (inside limit adjust) may significantly influence just how efficiently shifting proceeds.